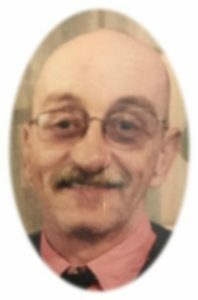 Steven W. Sackett, 54, of Wisconsin Ave. in Sheboygan, WI died May 8, 2017 at Froedtert Hospital in Wauwatosa, WI. He was born July 13, 1962 in Sheboygan, WI to John and Judith Strysick Sackett. Growing up he attended local schools. Living his whole life in Sheboygan, he worked various jobs at local factories. Steven enjoyed building model cars and watching NASCAR racing. He was a funny guy always learning and growing, searching for spiritual comfort. He enjoyed spending time with his friends, getting coffee or at The Open Door in Sheboygan. Steven is survived by his children Teanea Sackett (Ben Emmer), Steven Sackett and Vincent Sackett, grandchildren Sammantha and Dyllan, brother John Sackett (Lisa Peterson), special lady friend Sheila Oldenburg, step-mother Rita Sackett all of Sheboygan and step-brother Lawrence (Rhonda) Fouts of Sheboygan Falls. Further survived by former wives Tina Sackett, Sandy Kauger-Zill and Jacquie Sackett all of Sheboygan, nieces, nephews, other relatives and friends. The Family would like to thank the nurses and staff at St. Nicholas Hospital in Sheboygan and Froedtert Hospital in Wauwatosa for their support and care. Previous Post: Schoen, Dean E.
Next Post: Moore, Laura M.